(Nanowerk News) Researchers from the University of Cambridge have identified a class of low-cost, easily-processed semiconducting polymers which, despite their seemingly disorganised internal structure, can transport electrons as efficiently as expensive crystalline inorganic semiconductors. In this new polymer, about 70% of the electrons are free to travel, whereas in conventional polymers that number can be less than 50%. The materials approach intrinsic disorder-free limits, which would enable faster, more efficient flexible electronics and displays. 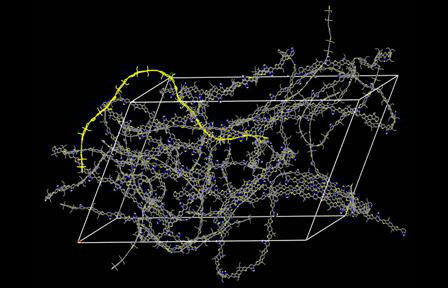 The results are published in the journal Nature ("Approaching disorder-free transport in high-mobility conjugated polymers"). For years, researchers have been searching for semiconducting polymers that can be solution processed and printed – which makes them much cheaper – but also retain well-defined electronic properties. These materials are used in printed electronic circuits, large-area solar cells and flexible LED displays. However, a major problem with these materials – especially after they go through a messy wet coating, fast-drying printing process – is that they have an internal structure more like a bowl of spaghetti than the beautifully ordered crystal lattice found in most electronic or optoelectronic devices. Now, the Cambridge researchers have discovered a class of conjugated polymers that are extremely tolerant to any form of disorder that is introduced by the side chains. “What is most surprising about these materials is that they appear amorphous, that is very disordered, at the microstructural level, while at the electronic level they allow electrons to move nearly as freely as in crystalline inorganic semiconductors,” said Mark Nikolka, a PhD student at the University’s Cavendish Laboratory and one of the lead authors of the study.